Festivals across the world are now beginning to rap up or finalise their lineups for 2016. Glastonbury finally blessed us with the first part of its lineup, Reading/Leeds is all but complete, as are other frontrunners in the UK such as Bestival, Latitude and V Fest. European shindigs such as Benicassim, NOS Alive, Outlook and Sziget are all finishing up their respective lineups too. With all-new festivals popping up by the week, it’s never certain which festival will shine lineup-wise, with smaller festivals such as Y Not, Love Saves The Day and Blissfields all managing to book some of the industry’s biggest names. 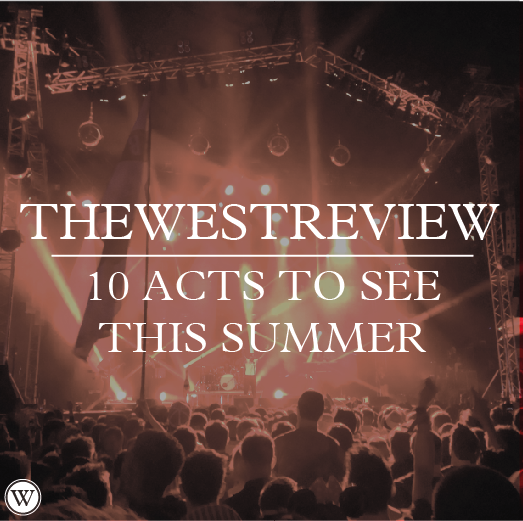 To help you make the difficult decision of which event to go along to, here is a list of 10 artists you should see this summer. Before I saw them twice last year at both Glastonbury and Bestival (above), I’d heard a thing or two about The Chemical Brothers‘ world-renowned AV performances. However, nothing could prepare me for the jaw-dropping hour and half (x2) I witnessed last summer. Of course flowing through their catalogue of anthemic hits, The Chemical Brothers’ pinpoint accuracy music wise, combined with picturesque visuals was one of the most complete performances I’ve ever seen. This year, the legendary big-beat duo are set to perform at an array of festivals across Europe, including three dates here in the UK. Think of Unknown Mortal Orchestra as somewhere between Tame Impala and Smokey Robinson. Last year, I begrudgingly trooped along to see UMO because a friend was desperate to see them, and thank God I did. One of the biggest surprises of summer 2015, UMO were intoxicating performers, irresistible with a guitar, hypnotic with the vocals, airtight percussion, they were easily one of the most effortless performers of last year. Special props must go to the very-talented frontman Ruban Nielson who had the crowd bouncing, swaying, singing, shouting and applauding with undeniable class. I’m not a fan of trap, in pretty much any sense of the word, so that rules out any interest in the [somehow] man-of-the-moment Travis Scott. However, while his music isn’t for everyone, his electric live shows should be. If you’re a fan of anything with a beat, anything high-octane, or anything with undeniable energy, then a Travis Scott performance is the one for you. The best example of this is the footage of his now-infamous performance at OpenAir Festival, in which he turns the crowd on one individual foolish enough to try and steal his Yeezys. Electro duo Snakehips have been circling for a few years now, making themselves known via a couple of their own songs such as No Other Way, or via remixes such as Bondax’s Gold. However, this year the pair have ‘blown up’ with the release of their incredible debut single All My Friends featuring big names Chance The Rapper and Tinashe. I saw them open for the aforementioned Rapper in London last summer and the set was an absolute dream of bangers, trawling through tropical house, hip-hop, drum and bass and house. Now is the time to see Snakehips as they continue their rise to the top. Massive Attack continue to be one of the most elusive artists out there. Popping up at a random event here, dropping music whenever they feel like it, it’s stressful being a Massive Attack devotee such as myself. However, after a six-year wait since 2010’s Heligoland, the trip-hop duo finally embark on a tour in support of their forthcoming and yet-to-be-titled sixth album. Expect grand light shows, an impeccable live band, and a plethora of guest vocalists, all overlooked by the elusive 3D and Daddy G.
One day, I will see Evian Christ. Ever since he popped up in the vast production credits of Yeezus, Christ’s dark electronica has intrigued, however, circumstances such as illness, a car breaking down, and an infamous festival cancellation have left me still none-the-wiser as to what to expect. That being said, Christ’s unsettling-yet-atmospheric electronica is not like much out there at the moment, and coupled with a bouncing crowd and a piercing light show, is certainly one to watch this summer. Kiasmos are an progressive electronic duo from Iceland. Very low-key, very underrated, very elusive, the pair weave house beats with classical strings to create powerful and seductive soundscapes that are simply a dream to listen to. I caught them at Electric Brixton in London not so long ago, and coupled with a clearly laboured-over light show, they were seriously impressive. With a little-but-loyal fanbase, expect a tightly knit, easy-going crowd to go with an exceptional performance. Back in 2013, I made the bold decision to see Chase & Status over The Rolling Stones, a decision that most people wouldn’t really think twice over: a drum and bass duo? Or one of the biggest bands of all time? I 100% made the right decision as it stands as one of, if not the, best thing I’ve ever seen live. With a setlist brimmed with high-octane bangers, crossed with crowd-pleasing surprises, it was simply electric. Chase & Status haven’t been doing proper all-out live shows since circa 2013, so a triumphant return to live shows in 2016 should be something even more special. The beautiful Lianne La Havas descended onto the Suffolk countryside at Latitude Festival last year and oozed absolute class. With guitar draped over her shoulder, and backed by a full band, La Havas’ was one of the most effortless performers I’ve seen. Following an impressive sophomore album, one of the best of 2015, La Havas has been booked into play a couple of lower-key festivals that are perfect places to catch and appreciate her irresistible charm.